Your dog could help save a life. A dog donor can safely give blood every 12 weeks. Why do Dogs Need a Blood Transfusion? 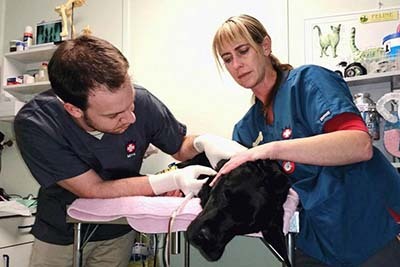 Dogs may need blood transfusions for different reasons. Blood is made of red blood cells, white blood cells, platelets and plasma. It can be separated into various components. The most common transfusions involve the use of red blood cells and plasma. Red blood cells are used for dogs with severe anaemia (low red cell count) or blood loss from trauma or surgery. Plasma contains antibodies, clotting factors and protein albumins. Plasma is often used for animals with clotting factor deficiency, rat bait toxicity, low protein albumin level, burns and autoimmune disease. What does being a Dog Blood Donor Involve? An admission into hospital is required for a dog blood donation, where we will perform a physical examination and a complimentary blood test to determine your pet’s blood type and to assess your pet’s health status. These blood tests will also provide useful information for your regular veterinarian and will be emailed to them for future reference. The dog blood donor procedure is a pain-free process, similar to that for people, except we use the vein in the neck (jugular vein) rather than the arm vein. A patch of hair is clipped and cleaned. Sedation may be required and intravenous fluids will be administered. You can be assured that your pet will receive first class treatment while in hospital and will receive a large bag of food of your choice or a gift voucher upon home time. They will also have their photo showcased on our Donor Wall of Fame and a story on our NEVS Facebook page. Your dog needs to fulfil certain criteria in order to safely be a dog blood donor. A dog blood donor can safely donate every 12 weeks. Blood cells will be replaced within a month of donation. We desperately need more canine blood donors. Each donation is going to help save the life of another beloved pet. Your dog can be a hero too! If you are interested in registering your pet into the Canine Blood Donor Program, please contact us. 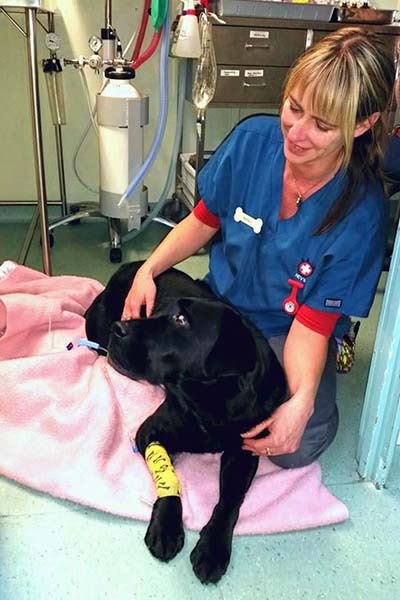 A donation of blood means giving the gift of life to an animal that is sick or injured. The demand for blood products continues to increase and we need the help of willing canine volunteers to meet this need. Along with a big thank you, NEVS offers a large bag of dog food of your choice or a gift voucher on completion of a dog blood donation.